 Under the title Radiophone, there are the well-known responses prepared by Jacques Lacan to seven questions that Robert Georgin asked him in an interview style, for the Belgian radio. The first radio broadcast took place in June 1970 by RTB (Belgium) and the ORTF (France). The text "Radiophonie" was published in Journal of Lacan Scilicet 2/3, 1970 and it was included in the collection of texts known as Other Writings.